Squirrel Watch: Friend Or Foe? 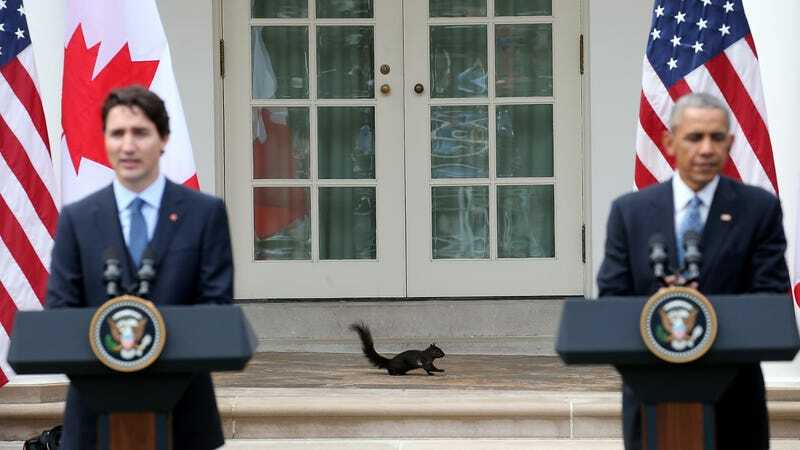 Following last week’s failed raccoon coup, it seems that the squirrels may have gotten some nutty ideas, too. Today’s edition of Squirrel Watch brings a confusing mix of romantic, vicious, and inscrutable deeds. One neighbor on the NextDoor app blamed people for leaving chips at the bottom of the trees. Constable said she has another theory. Perhaps looking to announce a declaration of war, a squirrel was spotted today moving up and down a stairway at the Time Inc. building in New York City. According to one Sports Illustrated writer, the squirrel was “completely wreaking havoc” and “owning security.” No word yet on the level of damage caused, but there is disturbing video of the incident. And now, some lighter fare—a tale of an vigilante squirrel using his powers for good. In Boise, Idaho, Joey gained fame for his heroic and righteous actions in February, when he attacked a burglar who broke into his house, scratching the thief until he fled. “If I had to guess, he found a girlfriend and they’re off doing their squirrel thing,” said Adam Pearl, who raised Joey in his home for about 10 months.